Though he spent less than ten years in Milwaukee, Paul Grottkau (b. 1846, Berlin [Germany], d. 1898, Milwaukee) may have had more impact on the early development of the Milwaukee labor movement than anyone. Employed as a mason in Germany, he became a union leader and outspoken Socialist and was arrested for his writings. In the late 1870s, he emigrated to Chicago, where he wrote for the Chicago Arbeiter-Zeitung and became a leading socialist. 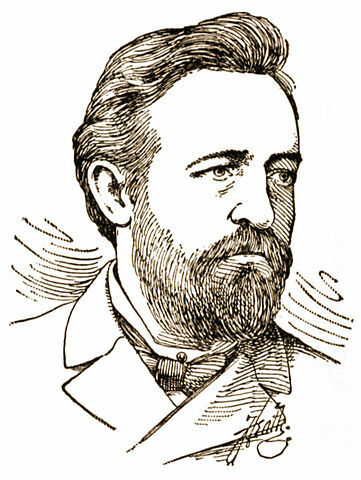 Arriving in Milwaukee in 1883, he soon led in forming the Central Labor Union to rival the Knights of Labor, which he believed was not militant enough. The CLU soon grew larger than the Knights and eventually became the Federated Trades Council (now the Milwaukee Area Labor Council). Grottkau was the principal leader of the massive eight-hour-day marches that began May 1, 1886 and ended with the Bay View Massacre on May 5. His out-front leadership led to his conviction to a year in jail for conspiracy to riot, for which he served six weeks. ^ Thomas W Gavett, Development of the Labor Movement in Milwaukee (Madison and Milwaukee: University of Wisconsin Press, 1965), 56. ^ Bayrd Still, Milwaukee: The History of a City (Madison, WI: State Historical Society of Wisconsin, 1945), 292-294. ^ Paul Grottkau, 1898, “Wisconsin, Death Records, 1867-1907,” FamilySearch online database, citing Death, Milwaukee, Wisconsin, Wisconsin State Historical Society, Madison; FHL microfilm 1,310,327, accessed May 28, 2017; The Inter Ocean (Chicago, Illinois), June 6, 1898, 7, accessed May 28, 2017. Gavett, Thomas W. Development of the Labor Movement in Milwaukee. Madison and Milwaukee: University of Wisconsin Press, 1965. Still, Bayrd. Milwaukee: The History of a City. Madison, WI: State Historical Society of Wisconsin, 1945. For years, I had known a bit about Paul Grottkau and his role in Milwaukee, particularly as it related to the Bay View Massacre of May 5, 1886. My knowledge, however, was a bit sketchy and once I began looking up information, I became fascinated with him. Born into an aristocratic family in Germany in 1846, he had planned to be an architect and as was typical in the day that meant working on construction jobs. He entered the mason’s trade and soon became active in organizing his co-workers, eventually founding his own union of masons. He was a skilled orator and writer, becoming editor of a Socialist paper in Berlin by the age of 25; eventually he was arrested for an anti-religious speech. Accounts differ as to whether he actually served a 16-month sentence or successfully dodged being jailed by fleeing to Chicago. In his activities, Grottkau worked with the famous Socialist Johann Most in Germany and with August Spies in Chicago, one of the eight arrested and condemned to hang after the Chicago Haymarket affair of May 4, 1886. Grottkau became estranged from both because of his dislike of their anarchistic views. Interestingly, the newspaper accounts of the day do not treat Grottkau kindly; he was described in totally negative terms by the Chicago Tribune on July 2, 1879 as an agitator to be feared and one who was narrow and ignorant in his views and a coward. The Tribune said he fled Germany to avoid going to jail, but several other accounts (including the Milwaukee Sentinel of May 7, 1886, in a fairly straightforward account) said he served as much as 16 months in jail. Various newspaper accounts described him as an anarchist, even though he had steadfastly rejected the concept and had been roundly criticized by other anarchists of the day. All three books listed in the For Further Reading section contain several pages on Grottkau and the circumstances of the time. Bayrd Still’s Milwaukee: The History of a City was published years ago and has perhaps the most comprehensive summary of the years up to 1945 and is highly recommended for anyone interested in Milwaukee history. The book is out of print but is widely available in the Milwaukee Public Library System Central Library and many of its branches. I yearn to learn more about Paul Grottkau and hope to find time to do so. I urge others to examine the life of this courageous early leader. ^ “Paul Grottkau,” Chicago Tribune, July 2, 1879. ^ “The Socialist Leaders,” Milwaukee Sentinel, May 7, 1886.